The Advance Tabco 7-PS-70-2X commercial hand sink has a backsplash that prevents water damage behind the unit. Users can mount the faucet firmly to the wall on their own with the two holes on the backsplash. Constructed from an elegant stainless steel that reduces scratches and corrosion, its seamless one-piece design can be wiped clean. 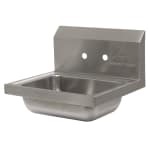 Its edges are rounded for safety, and its deep-drawn bowl is stronger than welded sink models. A no-drip edge lines the bowl to keep water off the floor. Curious about commercial sinks? Our buyers' guide explains the different types and their benefits.